It’s no secret that we love a good meal at Madison Park Foods, which is why Thanksgiving is one of our favorite days of the year. This year we’re celebrating in a big way with the introduction of our newest seasoning: Chairman of the Bird Gourmet Turkey Rub! It’s the quickest and simplest way to the best bird you’ve ever made. Purchase your own tin of Chairman of the Bird here, and check out our collection of Turkey Day recipes below. Want to make the perfect bird? Of course you do! We’ve made it easier than ever. Start with a fresh turkey. Thaw it in the fridge or in an ice bath first. Rinse the turkey and pat dry, and let it sit on the counter for about 30-60 minutes before cooking. In a bowl, mix up 1-2 large white onions, a few sliced and squeezed lemons, and as many cloves of garlic as you want. Combine with a splash of olive oil, and a hefty pinch of Chairman of the Bird. Mix well. Situate your turkey in the roasting pan. Stuff turkey with the onion and lemon mixture. Any remaining should be placed around the turkey in the roasting pan. Add a few tablespoons of olive oil to the outside of your turkey. Next, add a dash at a time of Chairman of the Bird, rubbing it in as you go. You can score the turkey skin and push some seasoning under the skin if you really want it to be packed with flavor. Add as much or as little as you want. Pour about 2 cups of chicken broth into the bottom of the roasting pan. Place your turkey into the oven and immediately drop the heat to 350 degrees. 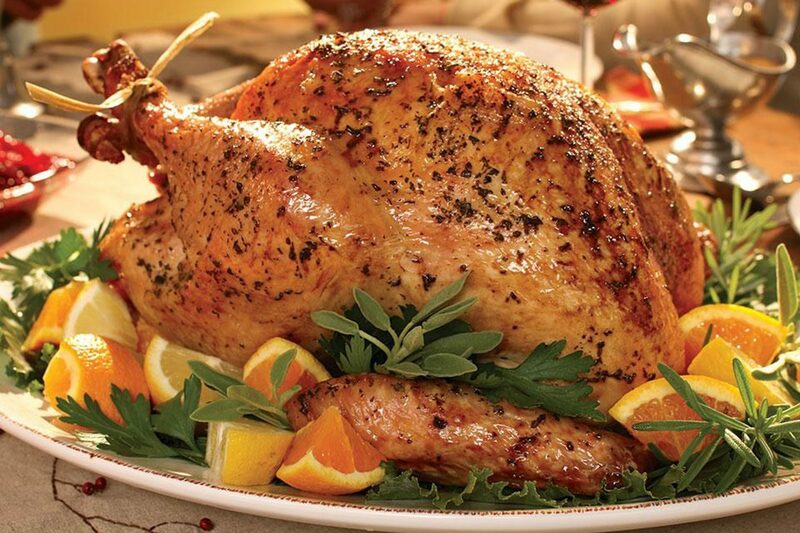 The rule of thumb for cooking a turkey is 13 minutes per pound. So our 16-pound turkey was estimated to cook in about 3 1/2 hours. Every 45 minutes, remove the turkey from the oven, close the oven door (don’t let that heat out! ), and baste the turkey all over. To baste, tilt the pan and use a turkey baster or spoon to scoop up the pan liquids and drizzle them on top of the turkey. Basting with pan juices cools the surface of the turkey and slows down cooking, which in turn keeps the breast meat cooking at close to the same rate as the legs and thighs. In the last 45 minutes or so of cooking, you can also baste the turkey with melted butter or oil. This helps crisp up the skin and turn it a beautiful deep golden brown. With that great turkey, you’ll need some stellar side dishes. The traditional sweet potato casserole is delicious, but if you want to save that sugar for dessert, try these roasted root veggies instead. We slow roasted these delicious root vegetables in our Colonial Tavern seasoning blend. Colonial Tavern is a unique blend of spices that were available to the earliest American colonists. For this dish, we used a rutabaga, carrots, a sweet potato, a butternut squash, and a sweet Vidalia onion. Any root vegetables are fine, including turnip roots, beets, parsnips, pumpkin, and acorn squash. This dish is super simple, and tastes like home. Start with your favorite root veggies, peeled and chopped. In a large bowl, pour olive oil over veggies and mix until coated. Add our Madison Park Foods Colonial Tavern seasoning to taste. Spread onto a baking sheet prepared with cooking spray. Bake for 90 minutes in a 325 degree oven, flipping veggies halfway to ensure even cooking. Optional: turn on broiler for the last minute or two to add a little darker color to the surface. Chairman of the Bird Gourmet Turkey Rub isn’t just for the birds, it’s great for stuffing, too. We’re loving the ease of baking your stuffing in a muffin tin. Introducing the Madison Park Foods Stuffins! Butter a muffin tin and set aside. Use an ice cream scoop to fill muffin tin with stuffing mixture. Of course one of the best parts of Thanksgiving is the leftovers, so we’ve got a great way to use that extra turkey, too! We put together these fabulous Turkey and Cranberry Egg Rolls (yeah, you read that right!) and we think they’ll make perfect hors d’oeuvres this season. They get their delicious flavor from our new Gourmet Turkey Seasoning, which is heightened by the tart cranberry sauce and the creamy havarti.